Moral standards seem to rigidly obey the second law of thermodynamics, which states that entropy (disorder) increases in a closed system. Most people would say society is more rude and corrupt today than in days gone by - count me among them. However, believing so does not obviate or excuse acts of deviance in the past. 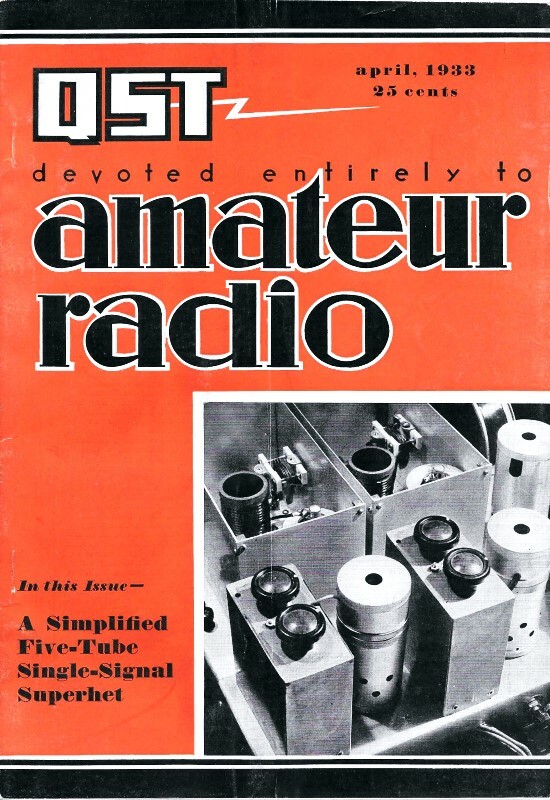 Indeed, even esteemed organizations like the American Radio Relay League (ARRL) seems to have been guilty of promoting dishonest acts. To wit, consider this offer appearing in the "Strayed" column of the April 1933 issue of QST magazine, "For Sale: QSL Cards of any country. Win your WAC without delay. Name your spot. We'll send the card." It also describes a scheme for ripping off electronics supplies stores. Shameful! In furtherance of the complication of the simpler things in life, it is with the greatest of animosity that we offer the following momentous disclosure of the marvel of the age, unfortunately brought to us by our Albion correspondent, who chiseled it from the inventor at 1 cent on the dollar. - Moratorium Editor. Contemporaneous technological development in the dissemination of edifying entertainment by propagation of electromagnetic disturbances of predetermined periodicity in the cosmical medium necessitates application of decidedly rigorous technique in the superintendence of the magnification prior to conversion in the detection device. To this end has been developed autonomous means whereby rectified components are ingeniously utilized alternatively, as it were, to superintend the magnification of introductory circuits of the receiver by utilization of the transconductance characteristic of the valves, or to reduce the magnification essentially to nonexistence in the absence of suitable electromagnetic impulses. It is obvious that quiescent autonomous magnification superintendence is indicated. Editor's Note. - What he means is, we gotta have quiet a.v.c. Nothing could give us greater pleasure than to announce the arrival of a new tube or something novel like that, but all we've got this month is a pair of cans. 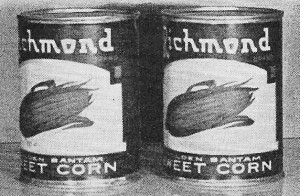 Made especially for the purpose of filling that need for an extra set of cans in the ham shack, they are particularly recommended for the use of those visitors who, after listening to your modest recital of your DX accomplishments, express polite but uninterested admiration and then begin a tale about all the DX broadcast stations they've heard. At this critical point the visitor should be requested to listen in a bit, on which you grasp one can firmly in each hand and with a rapid scissors-like motion clamp the visitor's ears firmly between the two. This is guaranteed to cause an immediate change of subject. Notwithstanding the fact that these cans fill a long-felt want, we predict that their popularity will be limited. Why? Oh, the manufacturer refuses to give more than 50% discount from the list price. Imagine a ham buying from a cheap skate like that! Anybody that reports is just a nasty old tattle tale. For Sale: QSL Cards of any country. Win your WAC without delay. Name your spot. We'll send the card. We have no limits to super-DX. Some of the best stations use our cards to high-hat their friends. Box 88, Whoopee, Wisconsin. Prize Thought: More Hams should visit more radio stores. Then, while one bunch keeps the owner's attention engaged, the others could walk off with more merchandise.